If your repository requires reviews, a repository administrator or collaborator with write access must approve each pull request before it can be merged. For more information about required reviews, see "About required reviews for pull requests." You can comment on a pull request, approve the changes, or request improvements before approving. For more information, see "About required reviews for pull requests" and "Reviewing proposed changes in a pull request." You can find a pull request where you or a team you're a member of is requested for review with the search qualifier review-requested:[USERNAME] or team-review-requested:[TEAMNAME]. For more information, see "Searching issues and pull requests." Tip: If a pull request you approved has changed significantly, you can dismiss your review. The pull request will need a new review before it can be merged. For more information, see "Dismissing a pull request review." In the list of pull requests, click the pull request you'd like to review. On the pull request, click Files changed. Review the changes in the pull request, and optionally, comment on specific lines. Above the changed code, click Review changes. Type a comment summarizing your feedback on the proposed changes. 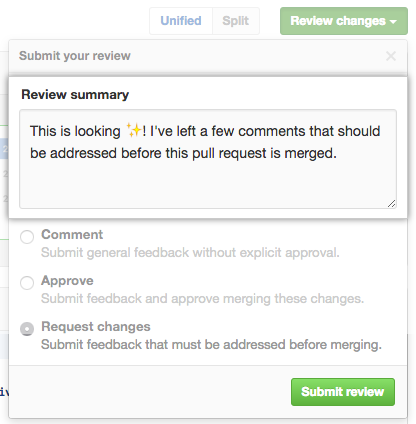 Select Approve to approve merging the changes proposed in the pull request. If required reviews are enabled and a collaborator with write, admin, or owner access to the repository submits a review requesting changes, the pull request cannot be merged until the same collaborator submits another review approving the changes in the pull request. Repository owners and administrators can merge a pull request even if it hasn't received an approved review, or if a reviewer who requested changes has left the organization or is unavailable. If both required reviews and stale review dismissal are enabled and a code-modifying commit is pushed to the branch of an approved pull request, the approval is dismissed. The pull request must be reviewed and approved again before it can be merged. When several open pull requests each have a head branch pointing to the same commit, you won’t be able to merge them if one or both have a pending or rejected review. "Commenting on a pull request"